Bungo at the Bells will be at the corner of Queens Square and Moray Place tonight. Gather from around 11.45pm, for a celebration and a bit of a dance with the Strathbungo community, as we welcome in 2019. Bring out your friends and neighbours. See you there! The Strathbungo Society was saddened to hear of the untimely death of Lesley McCallum last Sunday. Lesley was a stalwart supporter of the Strathbungo Society and former Committee member. 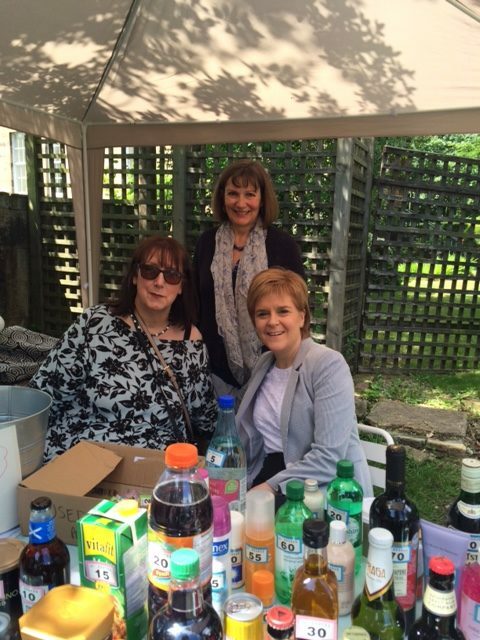 Lesley organised and ran the Society Bottle Stall at every ‘Bungo in the Back Lanes’ event since its inception and also hosted many ‘Bungo at the Bells’ events at her home at the corner of Queen Square and Moray Place. Lesley’s help and encouragement of the Society’s work will be sorely missed and the Society passes on its sincere condolences to her husband David, brother Alistair and nephew Jack. Rest in Peace. The latest newsletter has arrived. Coming through your door imminently, or you can read it here, or at the BygoneBungo Newsletter Archive. It’s that time again! 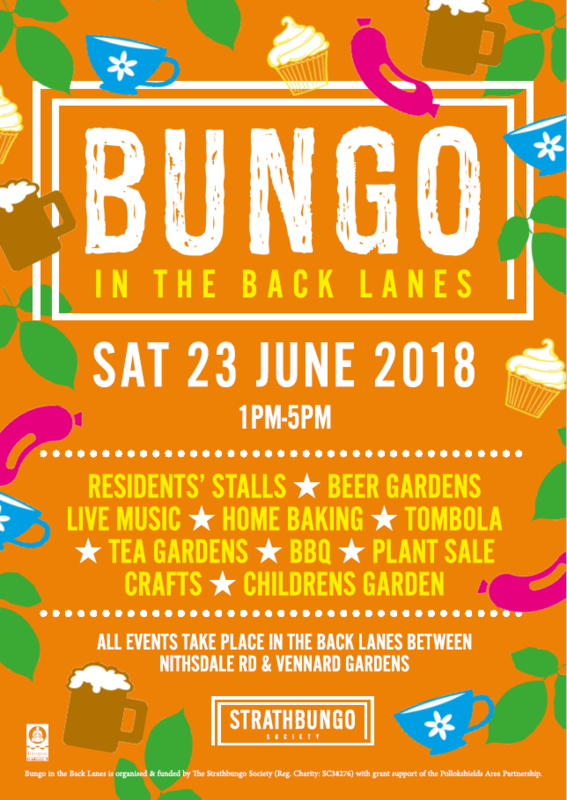 Bungo in the Back Lanes is back for 2018, this Saturday, 1-5 pm. It’s one of the Southside’s greatest and longest running events. Final preparations are underway, and the Bungo map is now available, showing just some of the events you can expect. Set up your own stall in your back garden / lane. Stewarding on the day – there’s a briefing at 11.45 at the Society stall in the Marywood / Queen Square lane, or just show up any time and say hi, if you can spare us an hour with one of our fancy new orange jackets! For more guidance see the FAQ on this site. 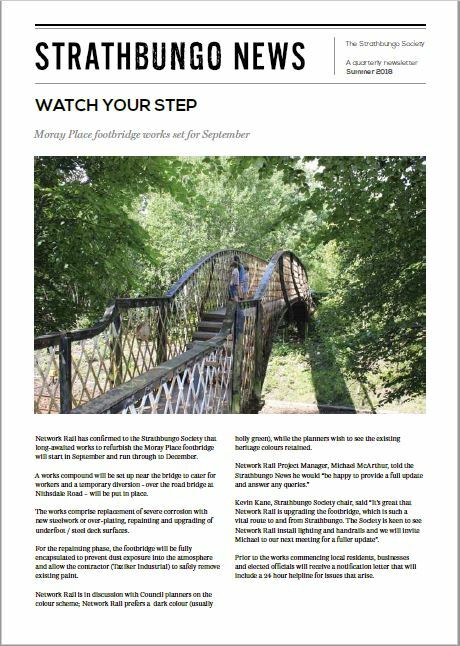 For those of you not lucky enough to get a shiny paper copy through your door, the latest Strathbungo Newsletter is available now, and you can read it here. It even features our new logo. It is also filed in the Bygone Bungo newsletter archive with its predecessors. 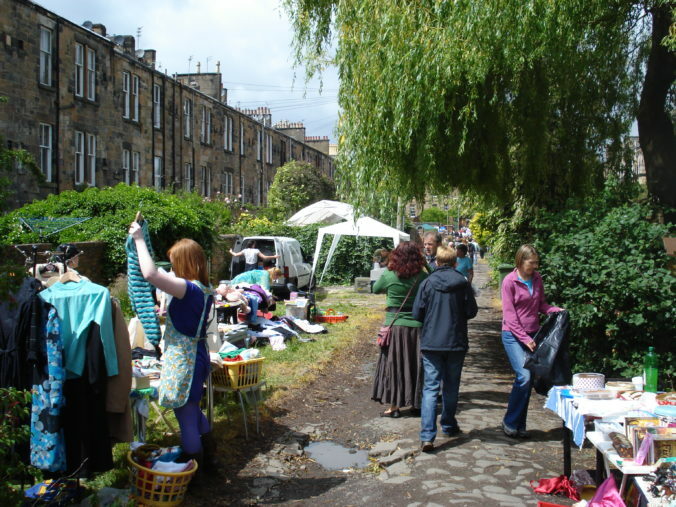 Famous for its residents’ stalls selling everything from bric-a-brac and jewellery to homemade food and crafts, Bungo in the Back Lanes is an annual community festival that takes place in the lanes of Strathbungo. The most exciting part of the festival is seeing which DIY stalls are set up on the day. Previous years have produced snail races, jumble stalls and a guess-the-sweeties-in-the-jar competition. This year, #BitBL2018 is on 23rd June 2018. Do you want to put up a stall? Are you happy to host a stall or three in your garden? Residents are free to open up their garden or let someone else use it. Please let us know if you are happy for your garden to be used and we can help match you with a stallholder. If you are not a resident and are planning on setting up a stall outside someone’s garden, please check first that they are happy for you to do so. Alternatively, there are several spots along the side lanes that are not directly outside people’s gardens. If you are selling from your garden, make sure you have good signage on the lane letting people know what awaits them. Otherwise, nobody will know! Do let us know where your stall is so we can add it onto our map. There’s more detail on our BitBL FAQs page. If in doubt, drop us an email at bitbl@strathbungo.co.uk and we’ll do our best to help. Bungo in the Back Lanes – hold the date! More details in due course, but anyone interested in a commercial stall can email us at bitbl@strathbungo.co.uk to register their interest. Please see the following link to a Glasgow City Council formal consultation on a Vision for Glasgow Parks and Green Spaces. I think we should be pushing for greater “city-wide” recognition for Queens Park – and much higher levels of maintenance. Btw – there is a Consultation Hub and there are several other consultation of relevance – Transport, High Street etc. – at the same GGC Consultations link which may be of interest. It is also filed in the Bygone Bungo newsletter archive with its predecesors.